“Oh, it’s just a pouch full of pebbles,” he said. It already seems more than enough for eleven year old Natasha Carr-Harris, but is there more? 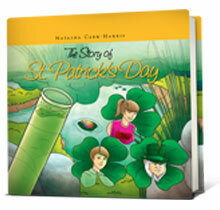 It seems so when she meets Edvard Green, a leprechaun from the “past” and learns about his mind-compelling and intriguing tale about St. Patrick. As their story slowly unfolds, a friendship develops and teamwork can be shown to help each other stay away from treacheries and dangers.